When the Soviet Union disintegrated, the prevailing view in the rest of the world was that nothing could fill the void left by its collapse. Few believed that any of the smaller political pieces that had been subordinate to Russia - the "republics" - were likely to find political and economic affiliation apart from Russia, away from the ill-defined Russian filter. Hundreds of times I was asked, literally, how Georgia could survive without Russia? Where else could Georgia go? How could its economy function without Russian inputs? In general, few people had sufficient imagination to think beyond the Russia paradigm. The main, I would say, the strategic goal, for us at that time was to retain our independence, to ensure political sovereignty and to start a painful - very painful for a turbulent nation-state- building process. We worked hard to diversify - maybe not always successfully - our international relations to avoid slipping into a CIS "gray zone," or even a "black hole." The definition is a matter of the analyst's political taste. From such a perspective, the subsequent development of events was quite startling. Not only did we establish new affiliations and relationships, we found them in ways that few people had anticipated. GUUAM is one of those new sets of relationships. GUUAM is the closest thing in the post-Soviet area to a strategic relationship. No, let me re-phrase that: GUUAM is a strategic relationship, even though the members of GUUAM may not be as adept at the formal constructions of strategies as, say, France or China. But we shouldn't doubt that this is what GUUAM intends to be. It is a group of states with common problems, threat perceptions and, I hope, a common vision of the future. Many are asking: where and what is GUUAM? Is it in or out of the CIS, is it pro- or anti-CIS, or is it against Russia? Let me answer this question: First of all, GUUAM is beyond the CIS, but it's neither anti-CIS, nor anti-Russian. It is a pro-GUUAM strategic relationship. It is not GUUAM that is introducing visa regimes with selected countries, erecting customs barriers within the CIS and limiting the opportunities of its members to choose their "external" economic partners. GUUAM's birth mother is the CFE [Conventional Armed Forces in Europe] negotiations, and its foster mother is NATO. Above: The five member countries of GUUAM - Georgia, Ukraine, Uzbekistan, Azerbaijan and Moldova-form a transportation corridor East to West. Two GUUAM members - Ukraine and my own country, Georgia - are direct NATO borderlands, sharing common boundaries with Poland and Turkey, respectively. Moldova and Azerbaijan are indirect NATO borderlands. Moldova shares borders with Ukraine and Romania. The latter, Romania, which will probably be the next NATO member, thereby moves Moldova up to a direct NATO neighborhood. Azerbaijan shares borders with Georgia and nearly so with Turkey, with which it is connected by ethnic and linguistic ties. Our newest member, Uzbekistan, is somewhat more distant but is linked to all the others via the emerging Eurasian Transport Corridor, by membership in the PfP [Partnership for Peace] programs, by our affiliation with the Euro-Atlantic Partnership Council, and by common strategic needs. And I'd like to emphasize here, at Stanford University, that today we cannot imagine our relations within GUUAM without another big "U" - Uzbekistan. In fact, all these connections prove that GUUAM is an ideally placed bridge for different European institutions into the heart of Eurasia. And it's a two-way bridge. The members of GUUAM benefit immeasurably from walking over the bridge toward integration into the Euro-Atlantic structures. After the dissolution of the Soviet Union, a number of regional organizations have been created within that space (CIS, Customs Union, Russia-Belarus Union, Eurasian Economic Union Treaty, etc.) But most have been established either artificially or under pressure. That's why almost all such organizations today are defunct, and from this perspective, not viable. One of the exceptions, or even the only exception, is GUUAM. The GUUAM group came up only after all its members had already formed strong political and economic relationships with states that lie beyond the former boundaries of the USSR. In Georgia's case, GUUAM came after we had developed dynamic relationships with our strong neighbor Turkey, with much of Europe, Israel and, of course, with the United States. The governments of Ukraine, Uzbekistan, Azerbaijan and Moldova similarly reached out to different parts of the world before they reached inward, toward old friends who share old problems. GUUAM is the proof of our growing sense of confidence in dealing with the unpredictability in our neighborhood. But it also presents strong evidence of our growing political maturity, in seeking common regional solutions to problems that cannot be solved easily from outside of our region. The development of GUUAM itself is evolutionary, beginning in spring 1996, when the delegations from the four states laid the groundwork for the consultations within the GUUAM format on the CFE flank issues, and evolving naturally and without any coercion. The range of issues for the consultations broadened and besides security, it gradually moved to cover political, commercial and economic matters and, naturally, the number of participant states also increased. Today these countries - Georgia, Ukraine, Uzbekistan, Azerbaijan and Moldova - are linked together: politically, by their Western orientation; economically, by their commitment to projects like the Eurasian transport-economic corridor, ideas incorporated into New Silk Road Legislation sponsored by Senator Brownback, and prospects for commercial activities within the Black Sea Basin; and strategically, by rebuffing CIS reintegration. I should admit, in this connection, that Russia, under the leadership of President Putin, is "quite successfully" rebuffing the same integration within the CIS: it will suffice just to mention the newly created Eurasian Economic Union Treaty. The north-south linkage that once defined Ukraine, Moldova, the Caucasus and Central Asia as separate regional issues is rapidly giving way to east-west linkages that triggered the emergence of a wide belt of countries - stretching from the Chinese border to the Black Sea region - that share a wide range of strategic interests. These new interests may be embodied in the planned east-west trade link that will connect Central Asia to Europe and in which GUUAM will play the role of a centerpiece. I would also cautiously underline that economic revival and prosperity within GUUAM should be built not by "constructing the pyramid" from above, as would be the case if we prematurely introduced a Free Economic Zone (FEZ). First, I think we need to start laying a solid basis by pushing - step by step, brick by brick - forward the legal reforms to harmonize the inter-communication of various national services, like customs and border guards, and implementing relatively smaller projects to start with. By doing this, I'm convinced that the understanding of our regional responsibilities toward each other can be rapidly advanced, at the same time laying the foundation for bigger constructions like the FEZ. These concerted efforts can withstand the mounting attempts of economic expansion from Russia that concern each and every one of us so much today. They diversify tactics of political-military compulsion with the aggressively enforced energy and commercial strategies. This can only be effectively counteracted by establishing the strong economic identity of GUUAM. We are also carefully watching the ongoing debate within the Russian political and military leadership over the defining of a new Russian defense strategy. Their probable gravitation towards the conventional warfare doctrine, combined with the above-mentioned "commercial assault" from the north, could have its impact on Russia's foreign policy projection in respect to its immediate neighbors. Let me tell you about several projects that can enhance interests towards GUUAM. For example, the concept of restoring the "Great Silk Road" has undoubtedly gained great importance. Nowadays this process is gaining pace to become multi-dimensional and multifunctional. It will rehabilitate and expand highways, railroads, air routes, air and sea ports, link the states of this new Silk Road with each other and the outer world via the most modern and sophisticated communications and information technologies and train a new generation of personnel to make it all work in concert. It is also apparent that the Great Silk Road, or Eurasian Transport Corridor, is not limited only to its transportation and commercial functions. In effect, it would become a stabilizing factor among the states of Eurasian space of the former Soviet Union and would foster the creation of a common market, new geo-strategic - I would say, geo-commercial - alliances, as well as facilitate the development of functioning democratic institutions. The idea of a Eurasian Corridor embraces the following three components: Europe-Caucasus-Asia Transport Corridor (TRACECA), East-West Strategic Energy Corridor and a telecommunications network. The international community has found it to be the most attractive one. It has already stimulated rehabilitation of the main component of transport infrastructure. The diversity of ongoing cooperation ensured the elaboration of restructuring programs for all means of transport systems. As a result, today we witness relatively - though this could have been better - successful operation of the Poti-Ilichevsk motor-ferry connection. 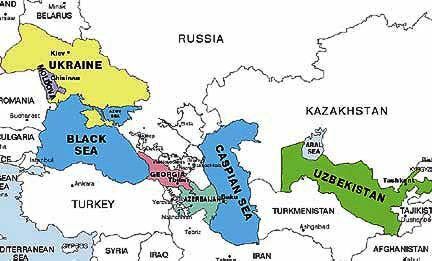 The existence of huge energy resources in the Caspian region proved the necessity of diversifying effective links with the world markets. "Energy Diplomacy" has turned into an important part of foreign policy for many countries of the region. The first completed regional project - the Baku-Supsa pipeline - has been functioning for more than a year. I want to assure you that the implementation of this project has already triggered a chain reaction of new ideas and new perspectives, at least among Georgian experts, and as far as I know, not only among them. These new ideas envisage the full participation of all GUUAM countries and other regional actors, including big powers, on a commercial and economic basis, which in the end should be the basic guarantee of a security equilibrium within GUAAM and beyond it. Sustainable transit service, safe transportation of oil and gas, requires the formation of a modern telecommunications infrastructure. The implementation of new technologies in this field and the realization of fiber-optic cable projects represents a basic part of the activities to be taken in this direction. Modernization of existing technological systems is also underway. These are the projects that should undoubtedly strengthen the independence and sovereignty of GUUAM countries, create a new atmosphere of trust and cooperation and improve security mechanisms, which in the long run will make the democratic and market-oriented reforms irreversible. This will eventually lead to the development of a common understanding and the perception of unity and common interests within GUUAM (which due to obvious reasons we may lack today) that will make this organization strong and viable. What are the benefits and advantages of GUUAM? Precisely this group could emerge as the first phase of activities within the above-mentioned processes and become a so-called "advanced group" of Silk Road counties. The established framework of consultations and consensus-reaching experience within GUUAM might serve as the solid foundation to build up new interregional cooperation. This is particularly important, when some states within this space might consider their development to be not quite in the same direction. I think, (no, I hope,) the accomplishments of GUUAM will set an example of success and definitely stimulate other countries to participate in the practical implementation of these ideas. The GUUAM mission should bypass the geographical boundaries of member states and reach out to a larger region. This is why GUUAM activities of the recent period were somehow redirected from strictly security and political consultations to the issues of an overall development of the Eurasian corridor. Nevertheless, all the above-mentioned can be implemented if a unified and advanced communications system (for example, Silksat) is created on the entire space and the artificial obstacles, which exist as a result of an inadequate legislature and unacceptable activities by some incompetent and corrupt officials, are removed. That is exactly the reason why today, contrary to any logical considerations, the majority of goods from Central Asia are transported to Europe by a substantially longer route through Russia and the Baltic States. The GUUAM States are responsible for laying the groundwork for the reversal of this situation. Definite work is being done in this regard now. In the nearest future, meetings of GUUAM experts will be held that will involve specialists from economic, energy and transportation sectors, representatives of customs authorities, border guards and tax revenue services. Such consultations among GUUAM experts will make the Free Trade Zone project feasible and ready to submit to the WTO (World Trade Organization). I'd like to draw your attention to some practical ideas, such as the recently conducted computer-based simulation training in Georgia, sponsored by the U.S. DoD [Department of Defense]. This program - S.E.N.S.E. (Synthetic Environment for National Security Estimate) - which is specially designed to facilitate a high-profile dialogue among the key decision-makers of the government and the private sector, might well be expanded to the regional and GUUAM format level. This will help us train a new generation of decision-makers, economic advisors and NGOs to harmonize their collective efforts for regional cooperation. In closing, I would say that GUUAM, in the long run, should not be limited to the countries of former Soviet space. We have to be open to invite - perhaps as observers - the adjacent states, which might share our interest in regional cooperation. Turkey, Romania, Bulgaria and Poland may be constructively engaged in discussions within GUUAM. The experience of GUUAM - like groups and initiatives has been highly useful. For instance, together with my GUUAM colleagues in Washington D.C., we have obtained ample information about the Vyshegrad Group, Southeast European Cooperation Initiative, South Balkan Development Initiative, Council of the Baltic Sea States and the Northern Europe Initiative. Our experts will study them and I hope that our Presidents will have sufficient information for the GUUAM Summit in Kiev to make appropriate decisions towards formalizing this group.